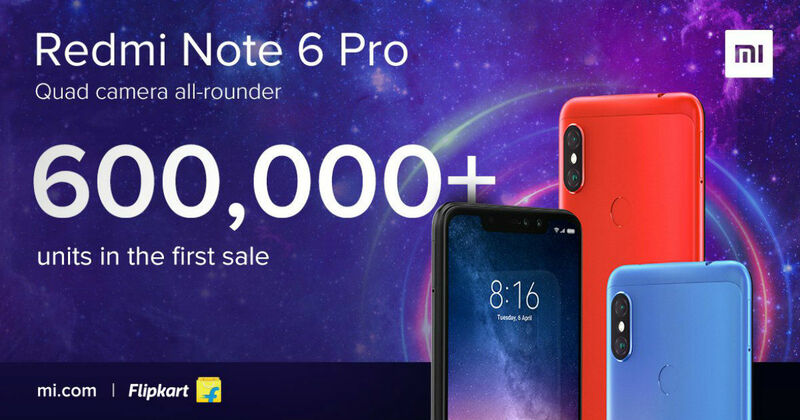 The Xiaomi Redmi Note 6 Pro was launched yesterday, and as part of its inaugural offer, the company offered Rs 1,000 discount for buyers, today. The Xiaomi Redmi Note 6 Pro was launched in India yesterday and went on sale for the first time earlier today. Now, Xiaomi India has tweeted that it has sold over 6,00,000 units in the first sale on the morning of November 23. This claimed figure has not even accounted for the 3pm sale that took place across Flipkart and Xiaomi’s own store, Mi.com. The first Redmi Note 6 Pro sale was over within a matter of minutes. 6 Lakh units of #RedmiNote6Pro ! The Quad camera all-rounder has taken the country by storm. More stocks incoming for the next special sale at 3PM on https://t.co/D3b3Qt4Ujl and @flipkart. The sale is live across Mi Home. The Mi Black Friday sale in question was announced by Xiaomi at the launch of the Redmi Note 6 Pro yesterday, where it also declared a temporary discount of Rs 1,000 on each of the two variants, only for today. The Xiaomi Redmi Note 6 Pro (review) was launched in two variants — with the 4GB/64GB variant priced at Rs 13,999, and the 6GB/64GB variant priced at Rs 15,999. Each of these variants have also been made available in four colour options, Redmi, Blue, Black, and Gold. Xiaomi’s Redmi Note line of smartphones have always been massively popular in India, buoyed by the strong hardware configuration and highly competitive pricing. The first of these phones that really took the country by storm was the Redmi Note 3 (review), which for its time bore excellent specifications at a ridiculously low price. The Redmi Note 6 Pro, meanwhile, houses a Qualcomm Snapdragon 636 SoC clocked at 1.8GHz, coupled with 4GB or 6GB of RAM and 64GB of storage. The display uses a 6.26-inch IPS LCD panel with 19:9 aspect ratio and gets a notch at the top to accommodate the two front-facing cameras. At the rear, there is a 12MP primary camera, supported by a 5MP secondary camera and dual-tone LED flash. The smartphone runs on Android Oreo 8.1, and is the first smartphone in India to run on Xiaomi’s MiUI 10 out of the box. The Redmi Note 6 Pro also includes a 4,000mAh battery, which is now equipped with Qualcomm’s Quick Charge 3.0. The Redmi Note 6 Pro will face tough competition in the sub-Rs 15,000 segment from the likes of the Realme 2 Pro (review), the Asus Zenfone Max Pro M1 (review) and the Honor 8X, among others. Xiaomi itself has other devices such as the Mi A2 (review) that is priced in close proximity, but Xiaomi will be hoping to give the Redmi Note 6 Pro a niche of its own by focusing on the ‘quad-camera’ aspect. Samsung Galaxy M20 vs Redmi Note 6 Pro: can the Korean giant topple Xiaomi in the mid-budget segment?